Finance and Economic Development Minister, Professor Mthuli Ncube addressing the media during a tour of Nestle Processing plant in Harare. Finance and Economic Development Minister, Mthuli Ncube Tuesday afternoon toured the Nestle Zimbabwe Plant in Harare where he expressed satisfaction over the way the company is run. Ncube pledged to support the food and beverage company with financial assistance to ensure its long survival on the market. 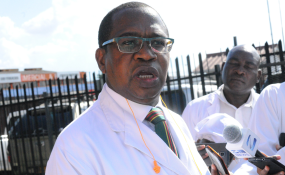 Speaking to journalists after the tour, Ncube said government will distribute foreign currency in a manner that ensures that performing companies are rewarded. "We can do everything that is required to make sure that they recommission these machines and be able to meet the demand that is there domestically and within the region. "We need to see how we can spread our foreign currency around so that they can be able to meet their demands," Mthuli said. Local industries have been crippled due foreign currency shortages.